You know how it is – you open up the boxes of old Christmas ornaments and there are almost always some glass balls packed away that are pretty, but past their prime. Perhaps the color is flaking from them, or the metallics aren’t so shiny any more. Consider embellishing plain glass ornaments or refurbishing old glass ornaments that aren’t quite as nice as they used to, by giving them a completely new, updated look this Christmas. Check our photo for the placement of your decorations. Cut a piece of ribbon and glue it around the centre of the ball. Use a little hot glue and glue on some tiny flowers, berries, ribbon, pine cones or other embellishments. 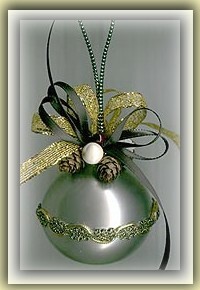 You may also be interested in ten ideas on How to Fill Glass Christmas Ball Ornaments using a variety of materials from bead or feathers to glitter and lace.